California delegates Kim Davis, left, and Elizabeth Ritchie, right, cheer after Chris Christie mentions Republican nominee Donald Trump on the second day of the Republican National Convention at the Quicken Loans Arena on Tuesday, July 19, 2016. Mariam Noujaim, 62, who is from Egypt, left, tries to make a point about immigration with Desiree Hoy, of Detroit, Mich., on East 4th Street in Cleveland, on the third day of the Republican National Convention on Wednesday, July 20, 2016. Hoy’s shirt bears a Muslim greeting written in Arabic, “Peace Be Upon You." 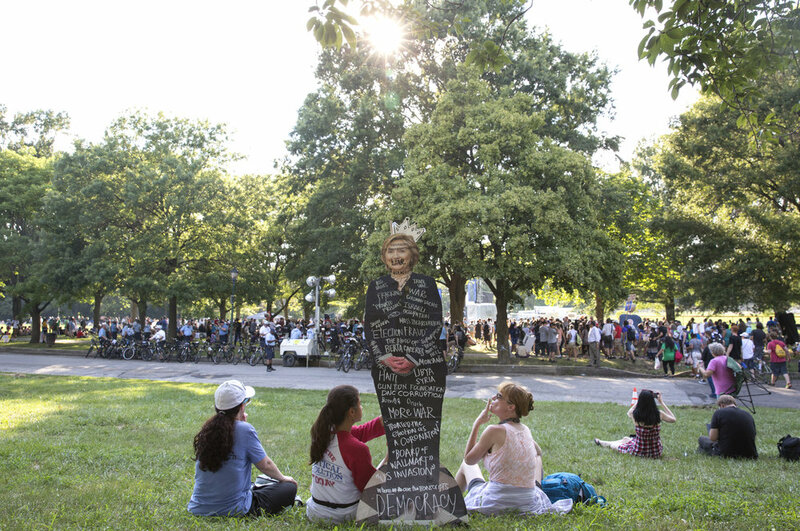 Bernie Sanders supporters hold up a Hillary Clinton cutout while sitting on the grass during the Democratic National Convention in Philadelphia on Tuesday, July 26, 2016. Former president Barack Obama speaks the day before the 2017 election at the “Get Out To Vote” event at Independece Hall in Philadelphia on Monday, Nov. 7, 2016. 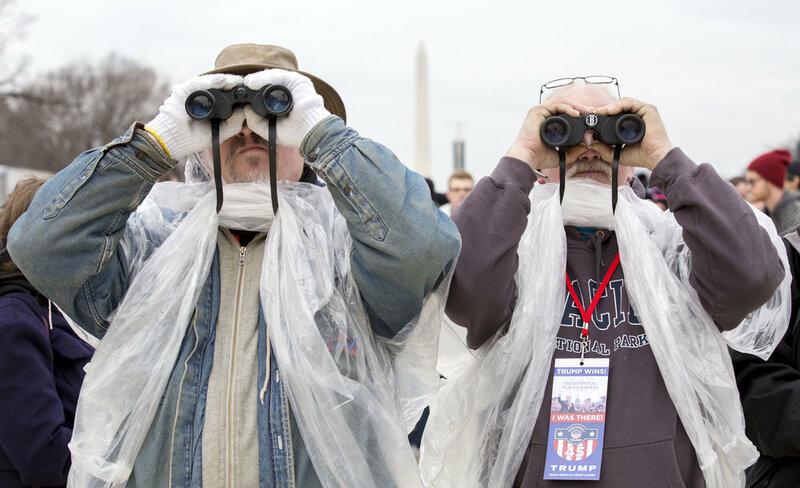 Dean Keppler, left, and Mark Koons, of Muncie, IN, use binoculars to get a better view of the capital as Donald Trump is sworn in as the 45th president. Keppler voted for Gary Johnson because he believed he was the better option between Trump and Clinton. Koons voted for Trump and he says he is “cautiously optimistic” that Trump will bring change. Ivanka Trumps walks in with administrator Linda McMahon for a roundtable discussion with small business owners of Pittsburgh on Tuesday, Feb. 13, 2018 in Mt. Lebanon. Tessa Sontheimer (junior-community environment and development) holds a sign in support of Hillary Clinton in front of a wall that was built by the Bull-Moose party on Old Main on Tuesday, Nov. 1, 2016. 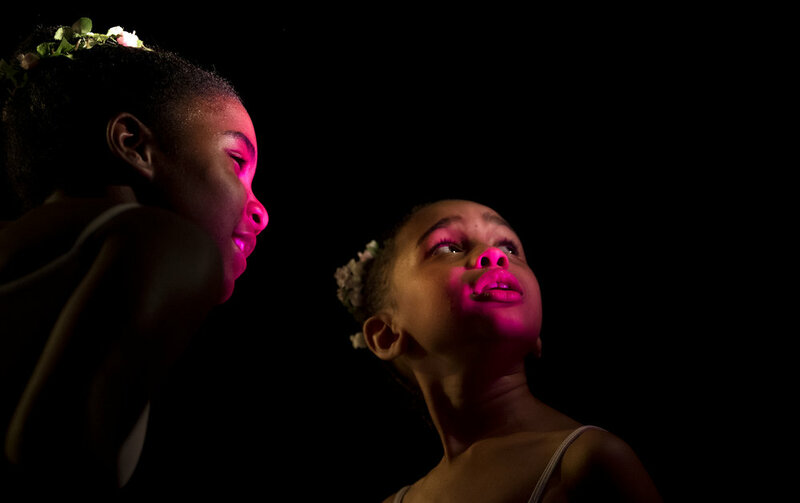 Ava Dominick, left, 10, and Neema Smith, 7, look at the stage light before getting ready for dress rehearsal with the Pittsburgh Ballet Theatre School in preparation for their May Spring Performance on Thursday, May 24, 2018 at the Byham Theater. Marious Chaney, 11, of North Side, flips his hair back and forth during a hot afternoon on Sunday, July 1, 2018 at the Troy Hill Spray Park. Frank Beale, of Weston, W.Va., explains the situation with his boss after crashing into his lead man’s truck on Tuesday, July 25, 2017 near the McKees Rocks Bridge. Beale was traveling from Aliquippa when he lost control of his truck. “Coming down that hill, all that traffic, I couldn’t get stopped. I hit my boss in front of me, the other truck that was with me. I was probably going about maybe ten, but I couldn’t go more down fast enough to come to a stop sign. Driver error, I reckon. I should have been more alert,” Beale says. Irene Morar grips the back of Michael Kopera’s, of Evan City, leather vest while riding on a motorcycle on Sunday, Sept. 10, 2017 at the Lutheran Senior Life Passavant Community in Zelienople. Caretakers at the Lutheran Senior Life Passavant Community wanted to fulfill Alvin Graf’s, 98 years old, wish of riding a motorcycle after not having ridden one since WWII. The American Legion Riders offered their help and came out to not only grant Graf’s wish, but also other senior residents who got the opportunity to go out on a joyride. Seth Brokenbek talks with the Post-Gazette while sitting in the entrance of his bunker that was built for shelter into a hillside on his property on Wednesday, Jan. 10, 2018 in Murrysville.